Because we’re one of the largest breeders of reptiles in the UK we understand that only the freshest and healthiest live foods should be used on your pets. 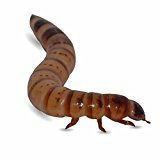 We have tested every supplier of live foods and we haven’t found a better set of mealworms than the ones we use now. We guarantee freshness or your money back. Delivered straight to your door, recorded delivery. This entry was posted in Reptiles and tagged aprox, Morio, Worms by One Boutique. Bookmark the permalink.